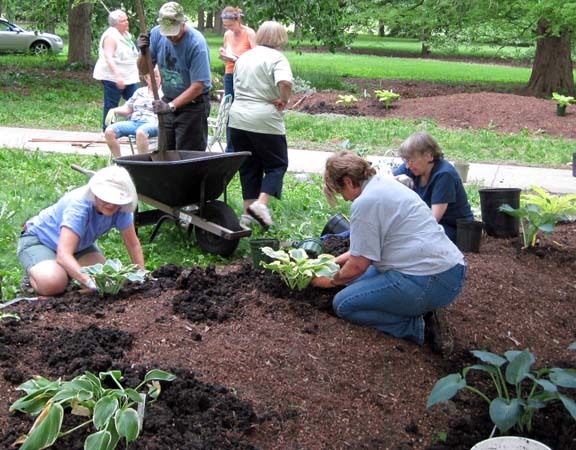 Designated in 2013, the American Hosta Society (AHS) National Display Garden at the University of Illinois Arboretum was initiated in 2010, installed in 2011 by members of the Illinois Prairie Hosta Society (IPHS) in cooperation with the UI Arboretum, and dedicated in the spring of 2014. To enhance the goal of educating the public about hosta, the garden contains a variety of shapes, sizes, colors and textures representative of newly-introduced and older, established cultivars. The garden contains more than 100 hosta cultivars registered with AHS and an additional 100+ hosta specimens growing among hundreds of shade companion plants. Since some of the site receives at least 4 hours of sun and offers dappled shade from large baldcypress trees, these shade-tolerant hosta and companion plants enjoy a hospitable environment. Many of the hosta in the National Display Garden were donated by members of IPHS or hosta hybridizers from their originator stock collections.